While reams have been written about the bride’s preparation for the big day, lets admit that men get a bit of a unfair treatment when it comes to journals and stories about wedding day shopping. After all aren't all catalogues, shopping guides, pray even wedding exhibitions clearly more directed towards the bride. And well while some may argue that with so much to do with the hair, make up, dress and jewellery, its only justified to be catering a lot more to the bride but then men shouldn't also have it too scarce. So for al the grooms-to-be out there, here is everything that you may need to focus on before setting out to shop for your big day. Before just randomly selecting a few outfits for your wedding function, it is best to prepare a list of important functions that are lined up for the big day. Select outfits keeping in mind the mood and the place for the function. For instance for a havan in a temple you may want to be seen in a kurta pyjama rather than a khaki and shirt combo. And while it is no vain guide to tell you that you would need to invest in a shoe closet to sail through your wedding, even a guy does need at least three pairs of shoes for different occasions. The thumb rule is - you will need a pair of jutis for traditional attire, a formal shoe to pair with western suits and a pair of semi casual slip ons for occasions where you may have to remove your shoes a few times. 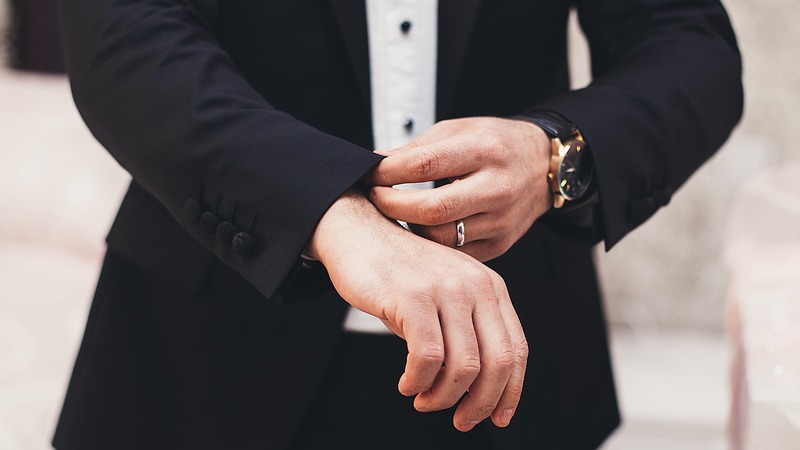 While there is no denying that a guy's accessory list is shorter and crisper, there are certain essentials that you cannot let go of. Buy a few handkerchiefs that you would want to dress on your coat pockets. Cuff links, good quality tie are other essentials. Also do not underestimate the importance of nice presentable socks. A good belt can also make or break the look. Always invest in a good quality leather belt preferably in a classic style for an occasion as formal as your wedding function. Trust Indian weddings to be occasions where a groom may have to take out his wallet at least once to please the sisters in law. Fishing out a wallet stuffed with extra visiting cards and motley bills are never a good presentation. Invest in a nice leather wallet and keep it stuffed with only the bare essentials. It will also be a good excuse to throw away all the unnecessary checks and bills thst have been piling up in your tiny wallet. this is also perhaps one of the few times in your life when you can go all out and flaunt your traditions. A colorful safa or pagri will set the tone for a grand Indian wedding feast. Invest in one in your favourite colour to wear during the functions. Sept. 22, 2017, 5:18 a.m.